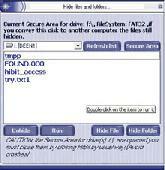 Hide Folder Flex is an access control utility for Windows. Hide Folder Pro is a computer security software to Hide your private folders. It is very useful to keep your personal data away from others.